High in nutrients and gluten free, sorghum has great potential in California. Sorghum isn’t a new crop to the Golden State. It was introduced more than 150 years ago. In the 1960s, a half-million acres were planted to sorghum, mainly for animal feed. However today it has been supplanted by corn, alfalfa and oats. Adaptable and drought tolerant, it may be posed to make a comeback. Increasing interest in gluten-free diets for humans may open new doors for the crop. Sorghum grain can be milled like wheat to produce a white flour for flat bread, cookies, pancakes and waffles. Whole sorghum grain may be added to soups, makes a dish similar to couscous, and can be popped like popcorn for snacking. The stems of sweet sorghum can be pressed, like sugarcane, to produce sorghum molasses or syrup. As a Peace Corps volunteer in Niger, Africa, in the early 1980s, Jeff Dahlberg was intrigued by sorghum, a staple food being cultivated by the country’s vast population of poor subsistence farmers. More than 30 years later, Dahlberg, the director of the UC Kearney Agricultural Research and Extension Center in Parlier, is still impressed with sorghum and believes it has potential to be a significant crop in California, where water is a serious concern. Dahlberg earned a bachelor's degree in biology at Occidental College before travling to Niger. In the central African country, Dahlberg served as an agricultural extension agent for the Peace Corps, where he worked iwth local farmers to assess the impact of rodents on traditional storage for grains. He and his colleagues learned earned was that the traditional storage methods were effective. Dahlberg’s primary method of outreach in Niger was demonstration plots. While living in West Africa, he traveled extensively, and experienced first-hand the role of millet and sorghum in feeding local populations. 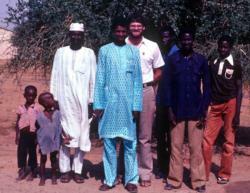 Jeff Dahlberg, center, during his Peace Corps service in Niger, Africa. After returning from Africa, Dahlberg earned a masters in agronomy and plant genetics at the University of Arizona, and went on to complete his Ph.D. in plant breeding and genetics at Texas A&M. He has dedicated his life to research that benefits the public good, and which has both local roots and global reach. The California sorghum research now underway at Kearney and the UC West Side Research and Extension Center is focused on hybrid forage and grain sorghum varieties. The results will also be applicable to varieties for human food and biofuel. The forage research will determine how to manage sorghum to maximize yield and reduce water and nitrogen use. Early results show that farmers can save a significant amount of water growing sorghum for dairy silage when compared with corn. “We use less than 20 inches of irrigation water on our sorghum plots and getting 22 to 25 wet tons of material off a single crop. A corn crop will need 36 inches of water or more,” Dahlberg said. The crop’s fertilizer needs are also quite low. 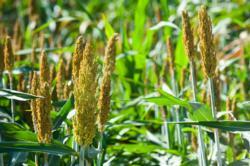 In fact, too much fertilizer can cause the sorghum stalks to fall down, or lodge, which hinders harvest. "When California farmers think about growing sorghum for gluten-free food, biofuel or animal feed, they will be able to access information generated by local research to help them make the decision," Dahlberg said.